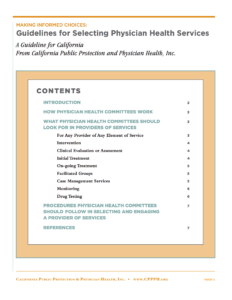 CPPPH Guidelines | California Public Protection & Physician Health, Inc. 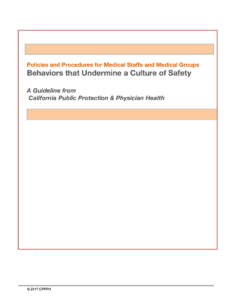 This document is intended for those in medical staffs, medical groups, and other entities with responsibility for decisions related to evaluating a practitioner’s behavior and/or compliance with the organization’s code of conduct. It is intended to assist them in the identification of policies and the implementation of procedures for support of professional behavior, and in the effective maintenance of the culture of safety and professionalism within the medical staff and the medical center. This document is intended to assist all those in medical staffs, medical groups, and other entities that have responsibility for decisions related to evaluating a practitioner’s health and wellbeing as they impact the practitioner’s ability to practice medicine safely. 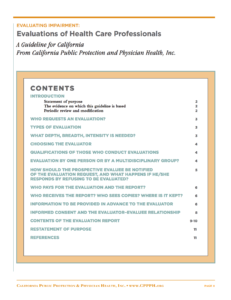 This CPPPH guideline describes all the elements involved in getting a clinical evaluation, including the qualifications of those who conduct evaluations, the preparation to be completed in advance, and the recommended contents of the report. 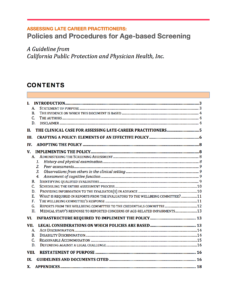 This document focuses on evaluations that are used to determine diagnoses, assess severity, identify appropriate clinical interventions, assess patient safety, and/or determine what steps should be taken to protect public safety, and the physician’s personal health and career. 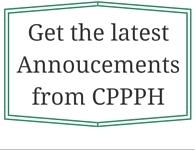 These CPPPH guidelines are addressed to hospital medical staffs and medical groups and all who have professional responsibilities for physician health and patient safety. They are designed to help you make informed choices among possible providers of different kinds of services.